Riads are traditional Moroccan houses or palaces with an interior garden or Patio, which allowed the family privacy and protection from the weather. What is the difference to Boutique Hotels? None, in Marrakech many of these Riads were turned into small hotels, independent owned with few rooms, local architecture and exclusive service. Dar Darma is situated in the Medina of Marrakech with breathtaking view to the Koutoubia Mosque and the Atlas Mountains, a private dwelling that offers traditional Moroccan hospitality in a relaxed, exclusive atmosphere. Dar Darma in Marrakech. Photo by hotel. Dar Seven is a small and elegant Riad in Marrakech’s Medina owned by Princess Letizia Ruspoli. Marrakchi designer Gérome Vermelin renovated and decorated the old house that is located close to the Sidi Benslimane mosque. Dar Seven in Marrakech. Photo by hotel. Palais Riad Lamrani is a restored 19th-century palace, nestled in the heart of Marrakech’s Medina. Amidst the atmospheric souks this boutique hotel exudes traditional Moroccan charm. The Riad is styled in Art Deco, regency furniture combined with local antiques. Palais Riad Lamrani in Marrakech. Photo by hotel. Riad Jaaneman is an elegant boutique hotel in the bohemian part of Marrakech’s Medina. The name Jaaneman is an Indian word that means “Soul of me” but translates into “My love”. In the refined oasis of urbane flamboyance classical style meets eclectic harmony. Riad Jaaneman in Marrakech. Photo by hotel. Ryad Dyor is located in the Sidi Ben Sliman neighbourhood, in the center of Marrakech’s Medina, a unique oasis of peace and serenity, offering a blend of authentic and modern design. Riad Dyor in Marrakech. Photo by hotel. El Fenn offers 28 individually styled rooms and suites, located close to the Djemaa el Fna square. Vanessa Branson and Howell James created a home from home retreat in a rainbow of colours. Retro furniture sourced from local flea markets was combined with one-off bespoke pieces to create a unique interior. El Fenn in Marrakech. Photo by hotel. Riad Snan 13 has a panoramic terrace with view over Marrakech’s Medina, Koutubia and Dar el Bacha’s Palace. The Patio was turned into a shared, yet intimate and quiet space. Riad Snan13 in Marrakech. Photo by hotel. Riad Tarabel is in the heart of the most beautiful district of the Medina, dotted with antique shops and the Dar El Bacha Palace. 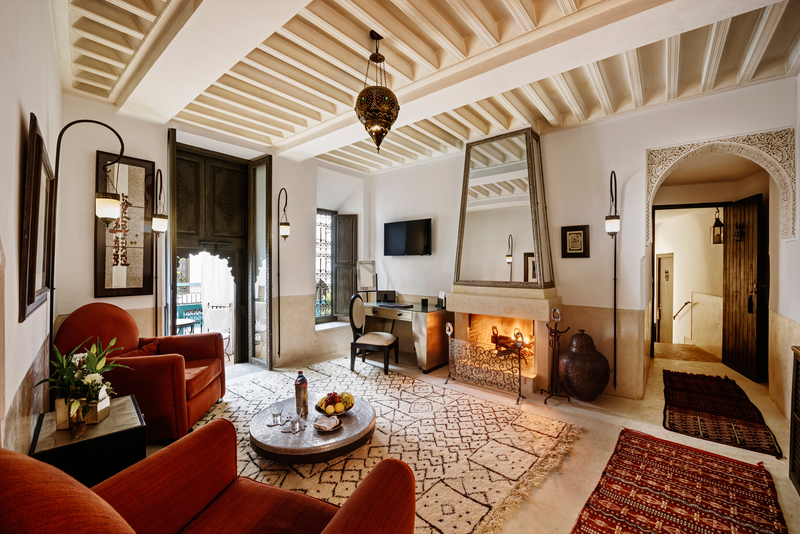 The Riad is an old colonial style mansion in an original decor blending subtle traces of Moorish architecture with Second French Empire style. Riad Tarabel in Marrakech. Photo by hotel. Riad Adore is contemporary ten bedroom riad in the in the very heart of Marrakech’s Medina, close to the souks, the monuments and the main square. The Riad was recently restored by the well-known architect Christophe Simeon. The modern Moroccan inspired décor evokes all the charm of traditional riad style. Riad Adore in Marrakech. Photo by hotel. Riad Les Yeux Bleus, located in the Bab Doukkala district in the Medina, features eight individually styled bedrooms. The Riad balances a blend of contemporary and traditional style with a pop-art touch in the choice of colors. Riad Les Yeux Bleus in Marrakech. Photo by hotel. What are your favorite Riads in Marrakech? Let us know! Love El Fenn. So many beautiful places to choose from but I also love Riad Farnatchi. Hi, thanks for your tips. But what’s the wonderful patio shown in the top?